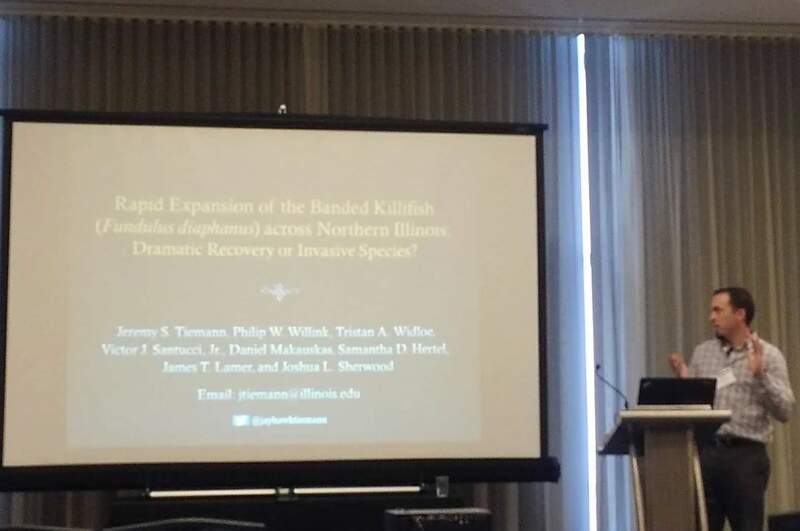 The PACE Lab was well represented at this week’s Midwest Fish and Wildlife conference in Cleveland Ohio. 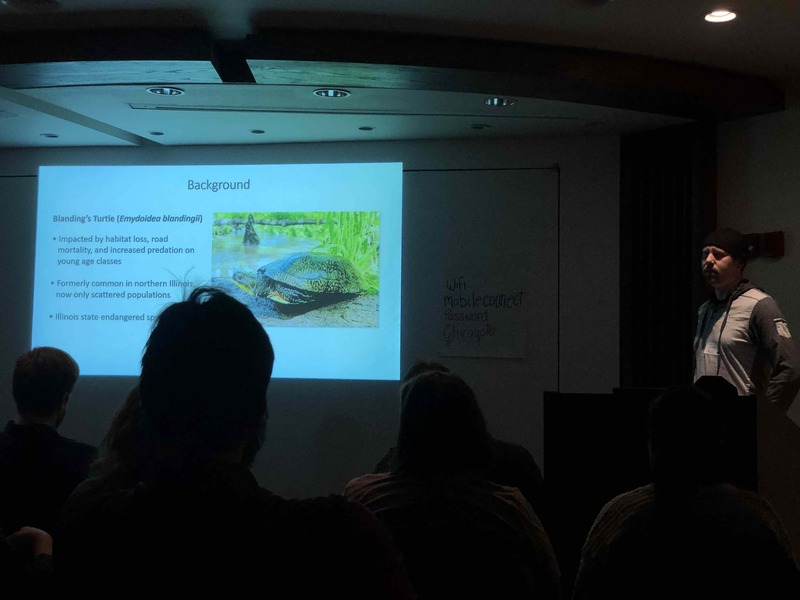 Lab members and affiliates from the INHS Herp Lab and the INHS Mollusc Lab presented 7 talks, 1 lightning talk, and 1 poster on a variety of fauna including: Massasaugas, Banded Killifish, Asian Clams, Alligator Snapping Turtles, Bigeye Chub, and Rails. 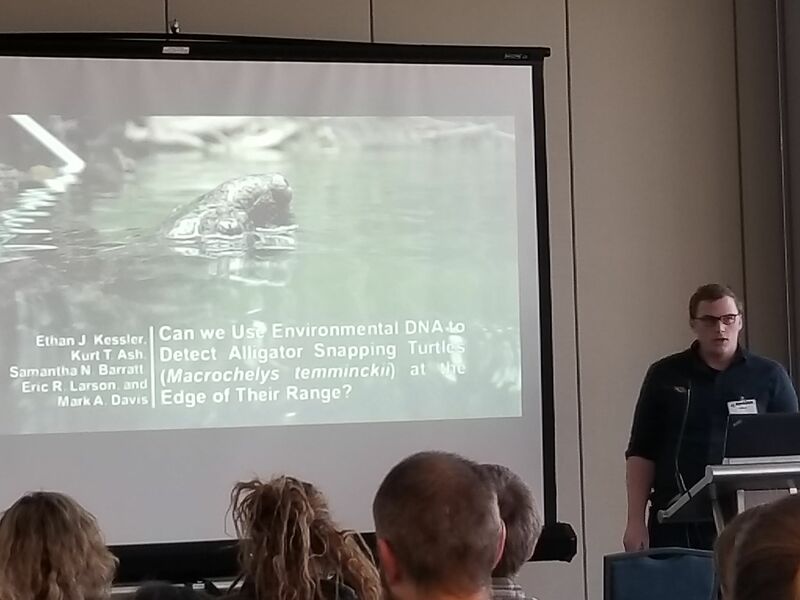 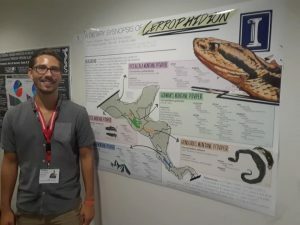 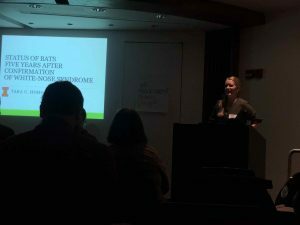 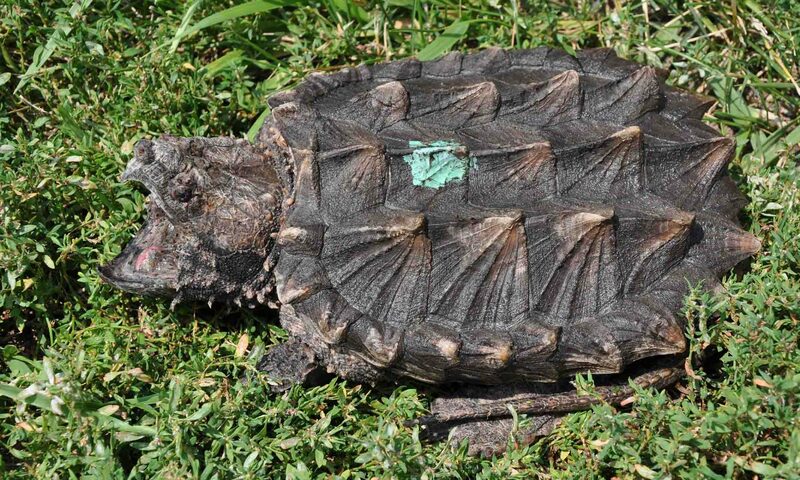 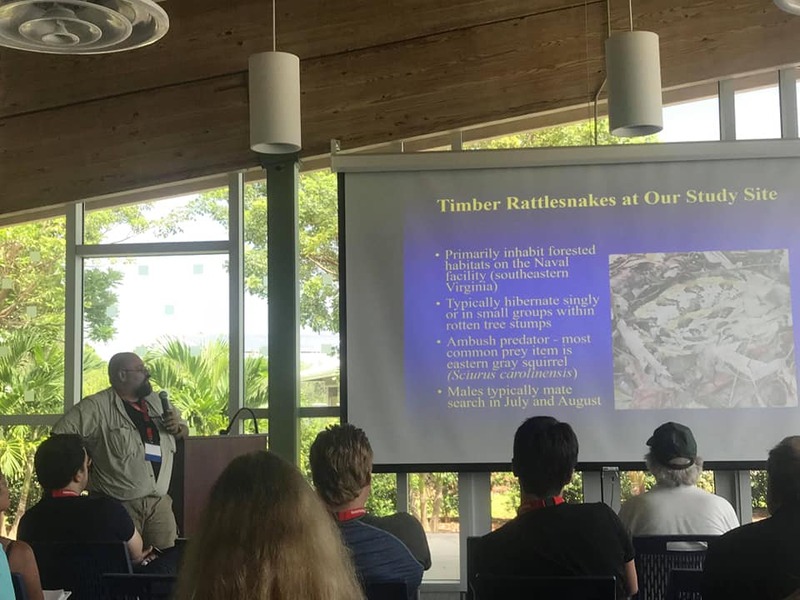 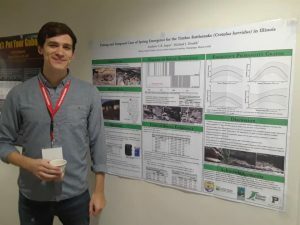 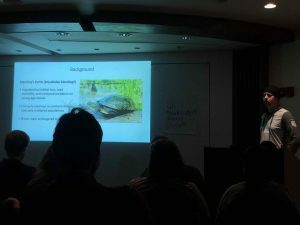 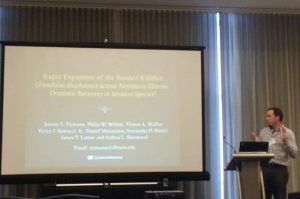 Members of the Population and Community Ecology and Herpetology labs here at the INHS gave several presentations at the first Venomous Herpetology Symposium in Miami, Florida, at Zoo Miami from September 8th-9th. 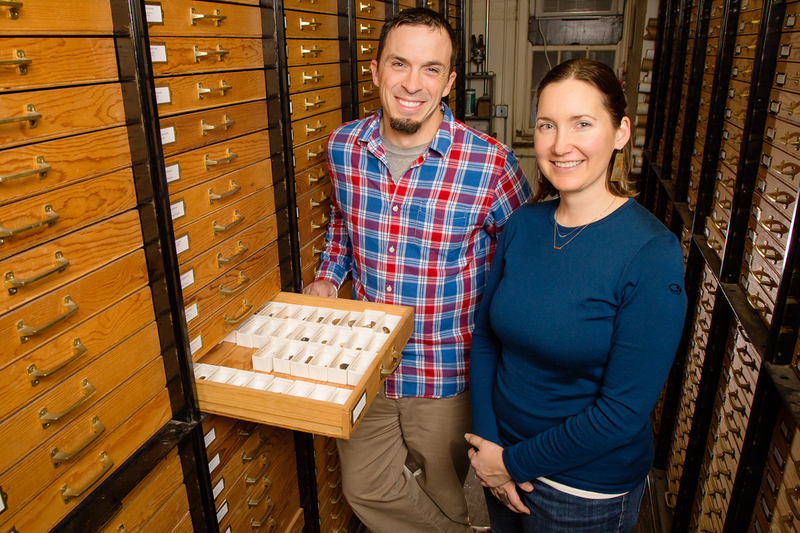 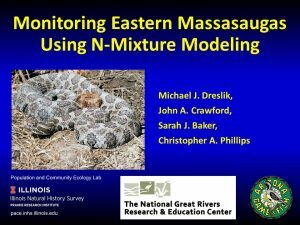 The work showcased the diversity of projects on venomous snakes the graduate and undergraduate students in both labs are working on. 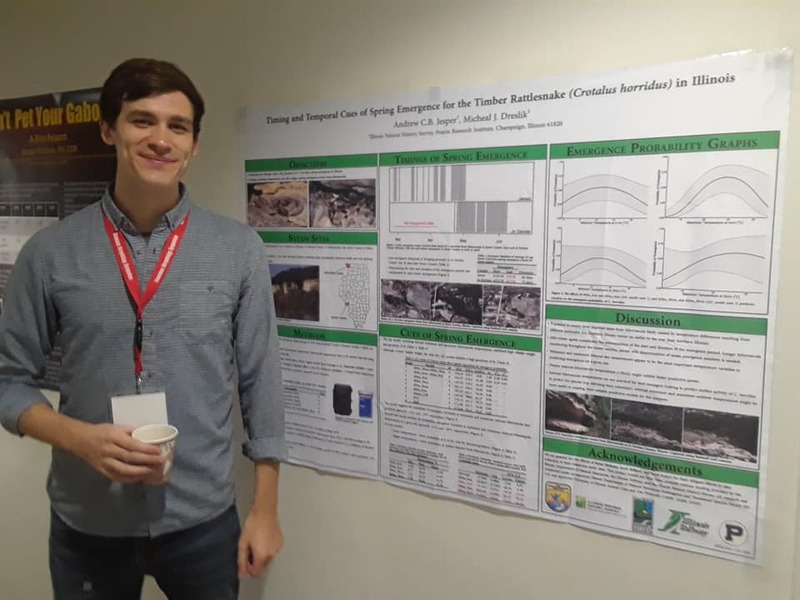 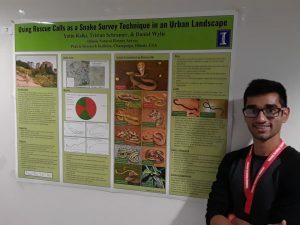 Recent graduate Yatin Kalki had received a travel award to attend and present at the symposium. 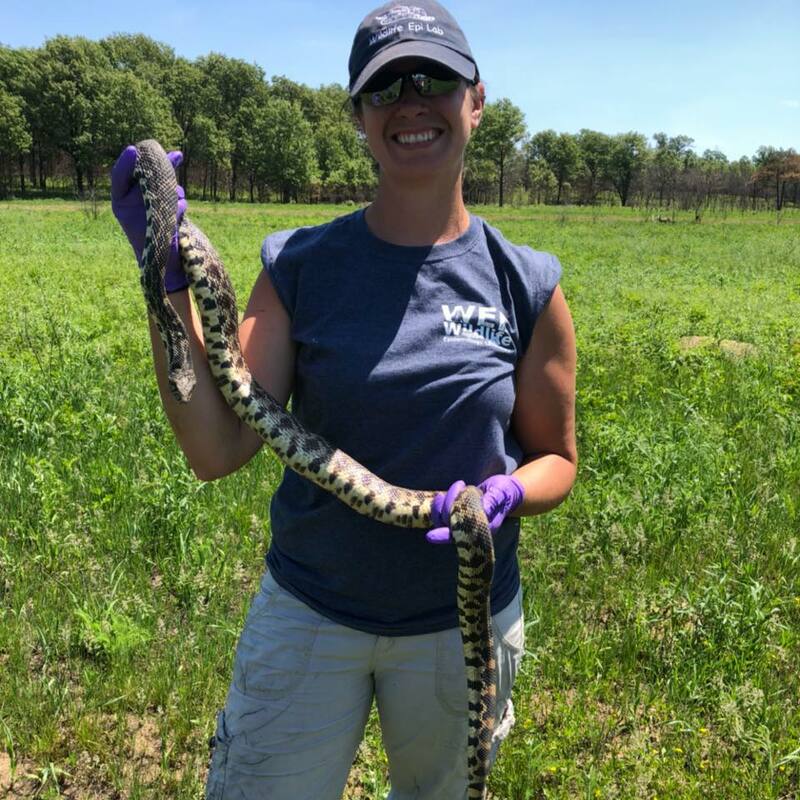 Using rescue calls as a snake survey technique in an urban landscape. Yatin Kalki, Tristan Schramer, and Daniel Wylie. 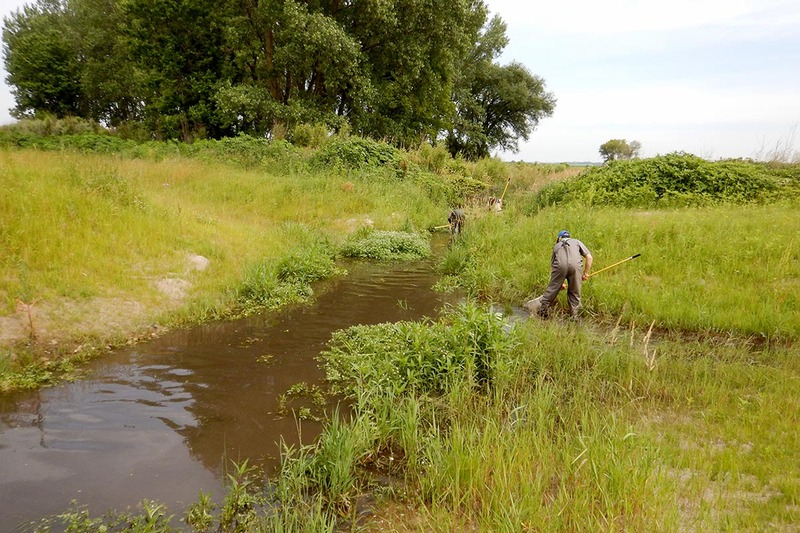 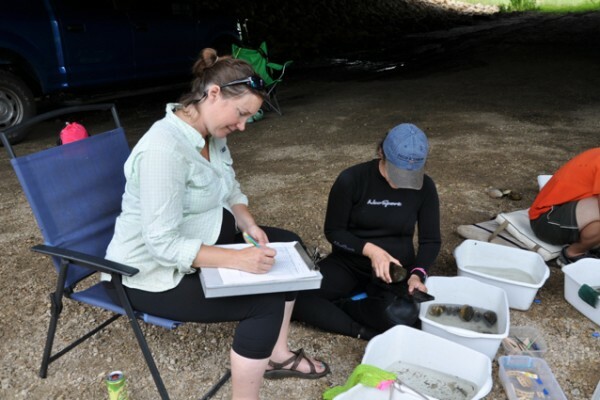 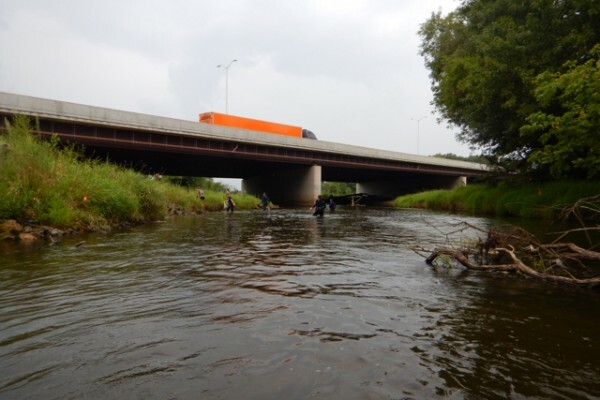 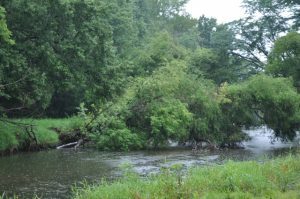 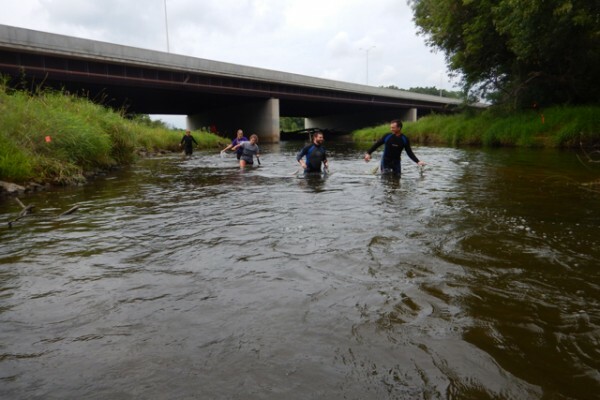 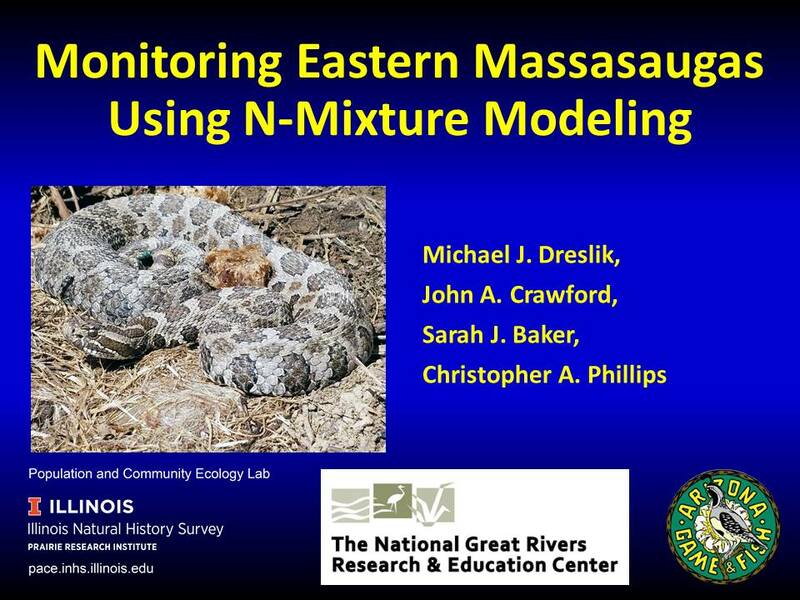 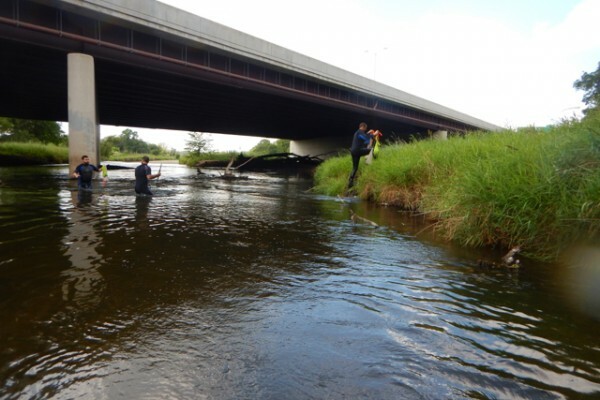 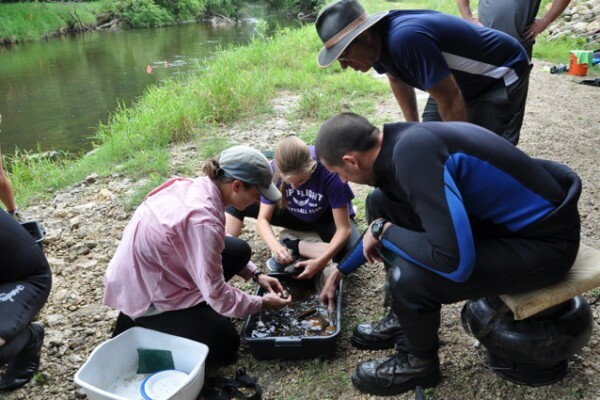 August 2018 marks the 4th year of the long term mark recapture movement study of mussels in the Kishwaukee River, led by malacologist Sarah Douglass. 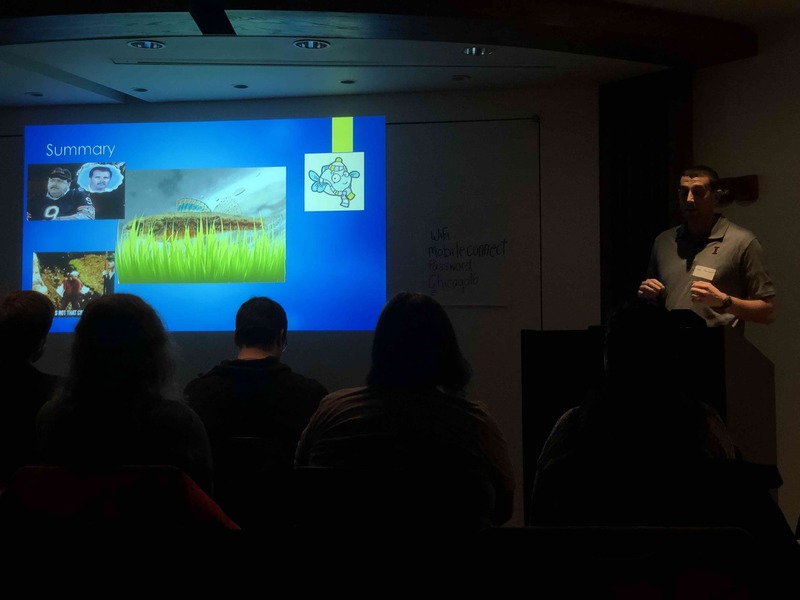 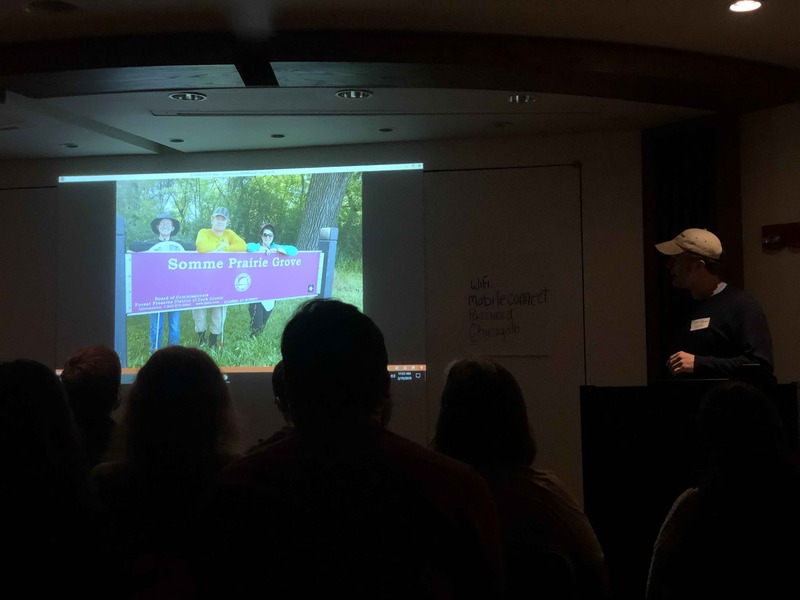 In addition to the staff from INHS, local forest preserve districts and IDNR, this year we were joined by several dedicated high school students and their teacher. 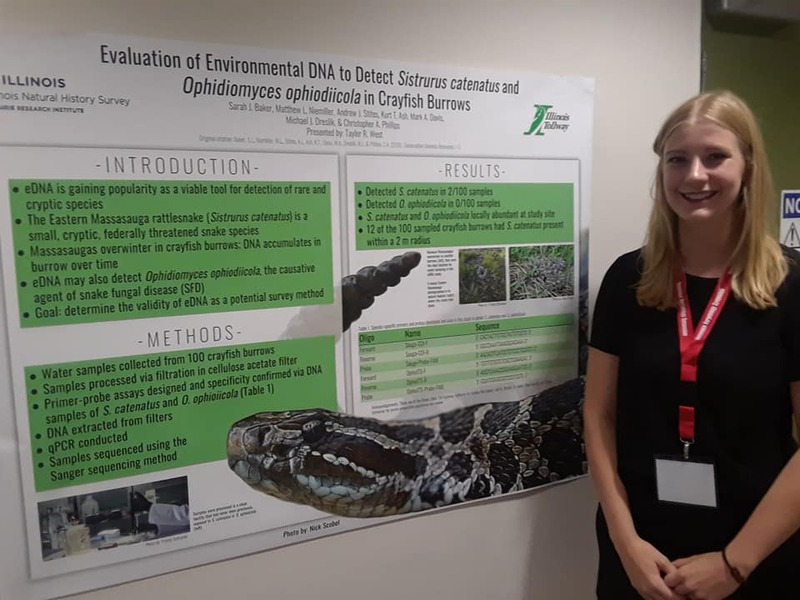 Earlier this year, Douglass came across a poster at the Freshwater Mollusk Conservation Society Mollusk Health & Disease Workshop that immediately caught her attention. 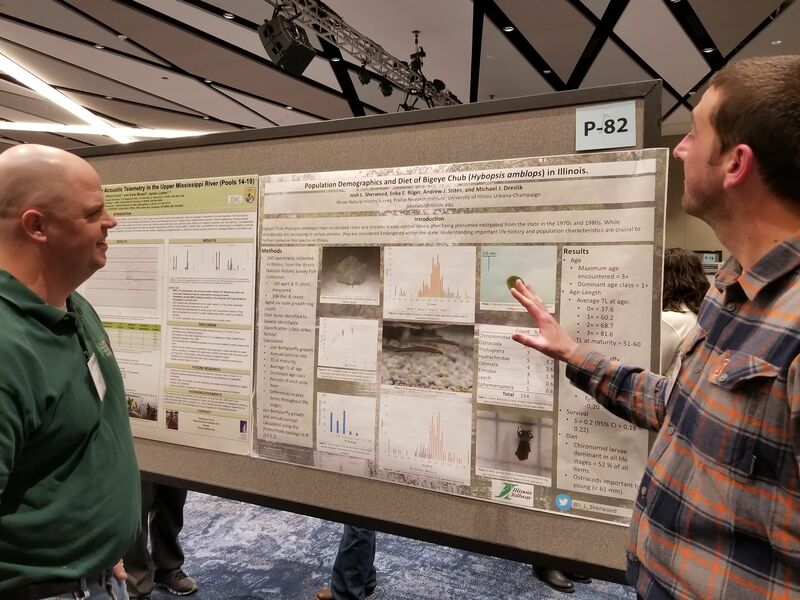 The poster “A Comparison of Substrate Preferences for Native and Invasive Mussel Populations in the Kishwaukee River,” was presented by two students from an environmental science class at Sycamore High School. 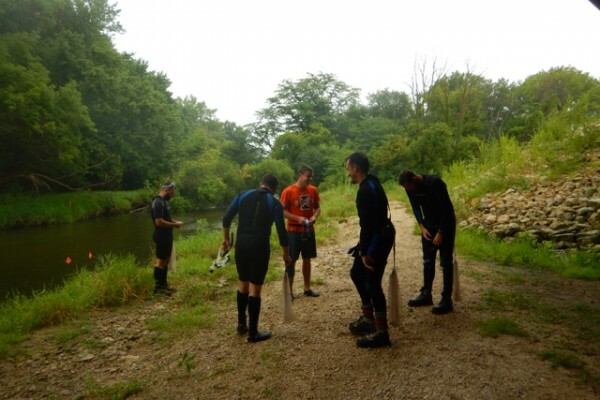 Led by teacher Scott Horlock, the “Watershed” class studies the South Branch of the Kishwaukee River to learn ecological lessons in a real world setting. 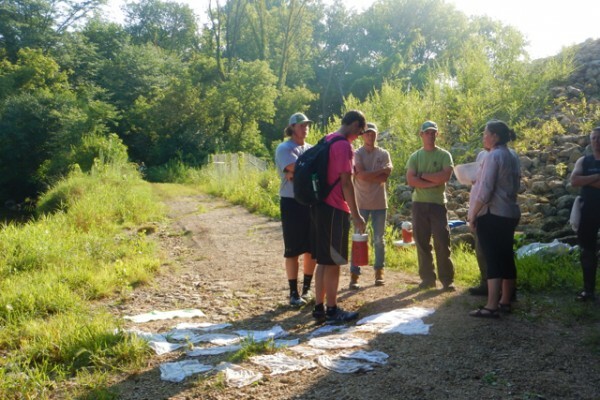 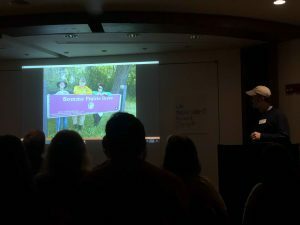 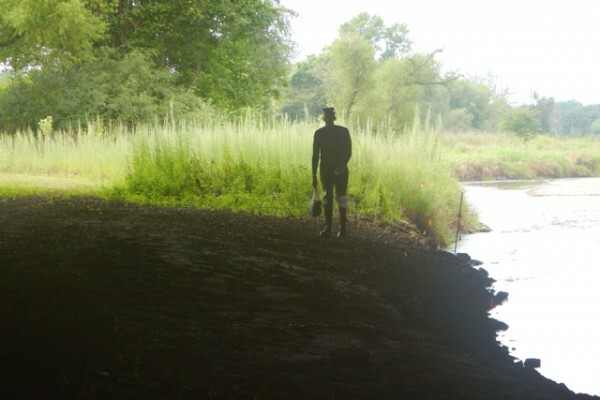 Always eager to inspire the next generation, Douglass invited Horlock and his students to join in the annual survey conducted on the Kishwaukee River. 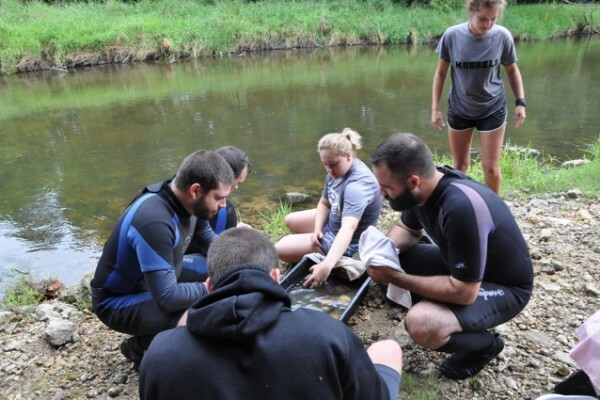 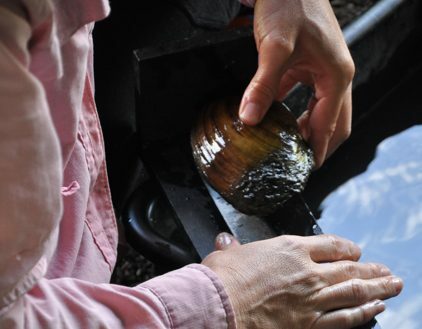 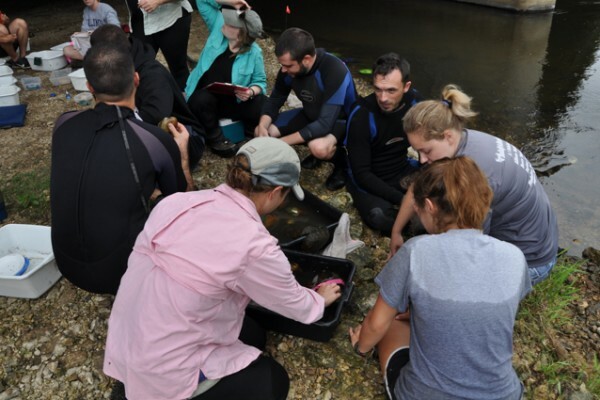 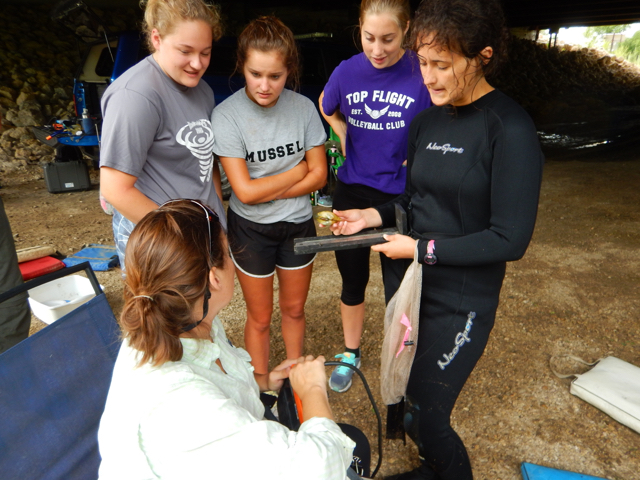 Despite it being summer break, Horlock accompanied a small group of students to the study site each day to learn about the sampling methods being used and become more comfortable with mussel species identification. Even with a bit of rain, the river was what Douglass referred to as “nearly prime” for sampling. 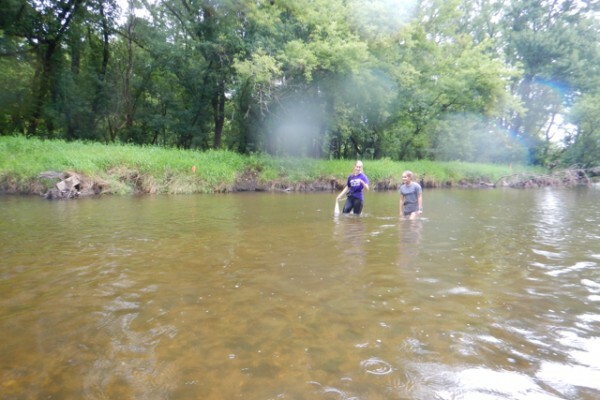 Like last year, we set out into the river, each claiming one of the 10m transects marked off by orange flagging tape. 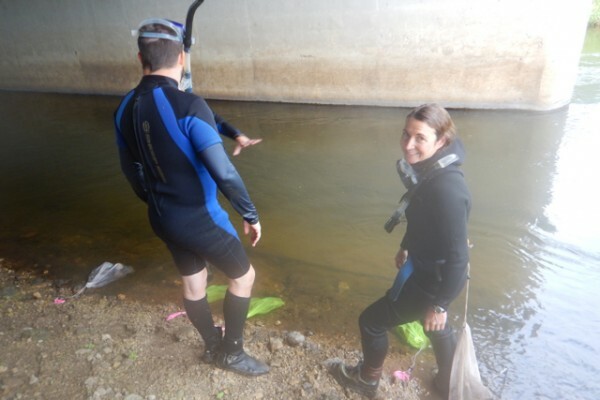 We waited for the timer to yell “Start!” stuck our heads in the water and fingers in the substrate to locate as many mussels as we could before hearing “Time!” After each timed survey we’d head back to our station under the bridge with bags of mussels to be marked and measured, gently ribbing each other about who found the most or best mussels. 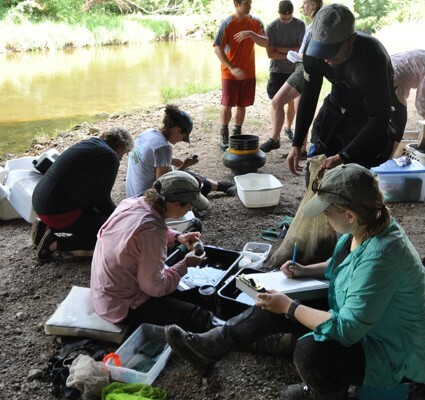 Teams assembled to tag and measure all of the mussels, being careful to keep the mussels from each transect separated to return to their locations. 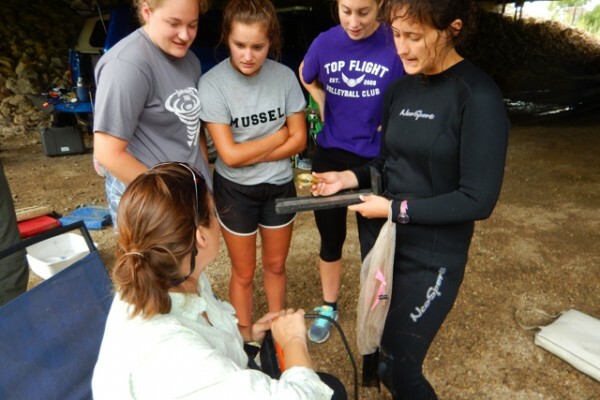 The students joined in, eager to learn more about the mussels they had collected. 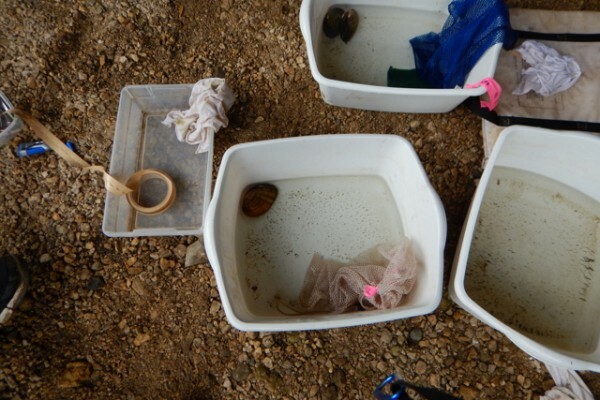 While cleaning and tagging the shells, the malacologists pointed out the subtle differences between similar species. 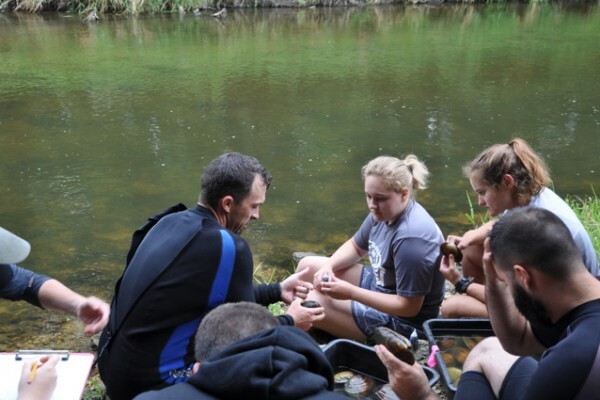 With each batch, the students (and other non-malacologists) became more confident in their skills. 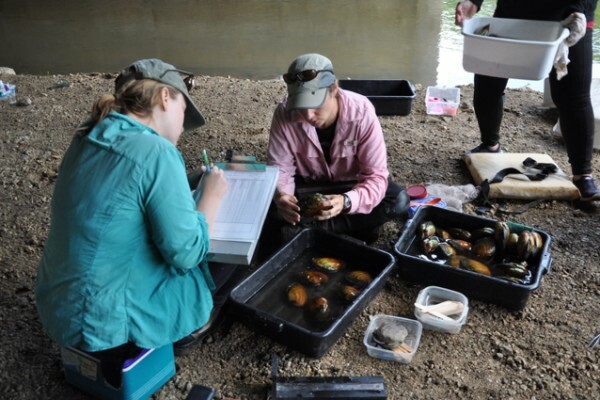 Over the course of the three days, we found over 600 mussels, representing 17 species. 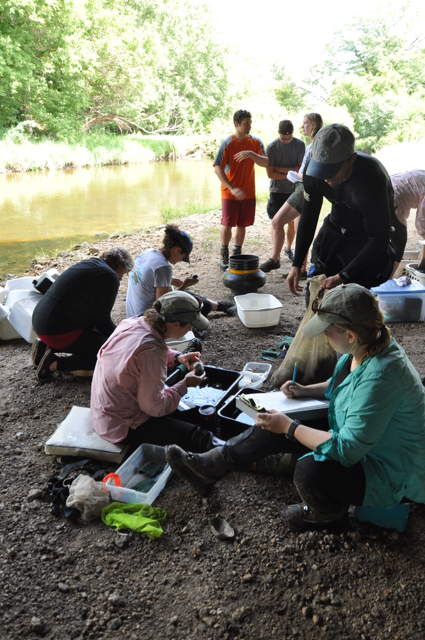 Many of the individuals collected already had a color coded tag from a previous year, which is imperative to monitor the survival and movement of mussels in the stream. 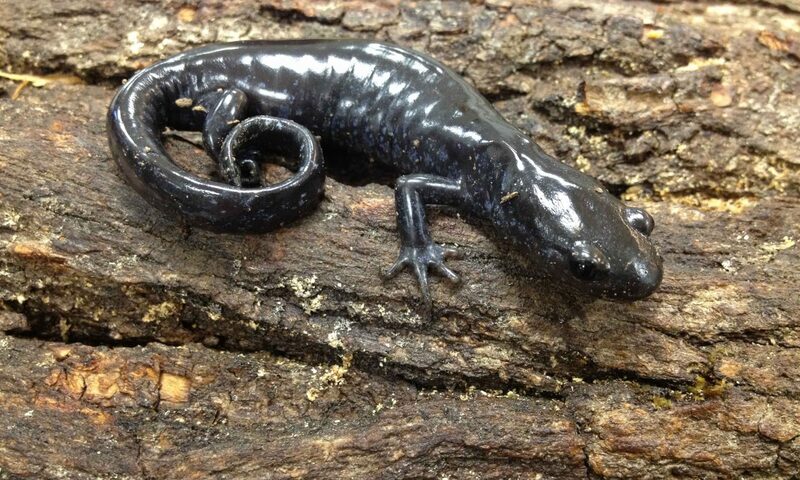 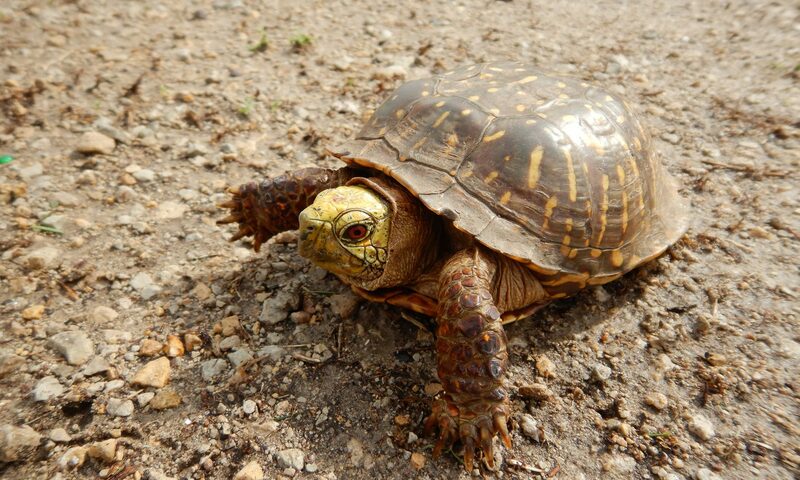 We added 4 new species to our list of live species this year: Fawnsfoot, Creek Heelsplitter, Threeridge, and Round Pigtoe. 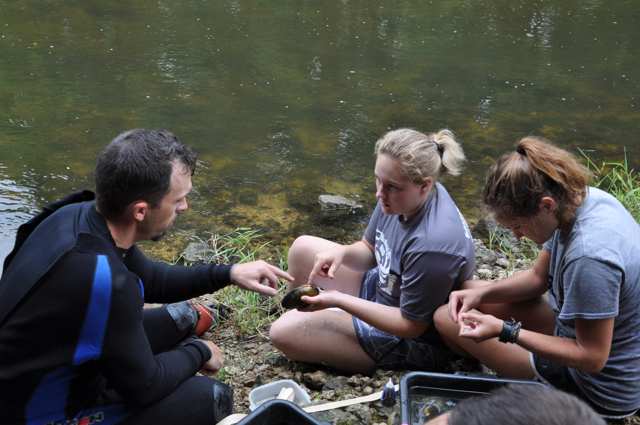 We also found one shell of a Pistolgrip, a species we hope to find live individuals of in future surveys.